Read and reviewed on July 2nd. For that handful that don’t know the story, eight-year-old Fern Arable saves the life of the runt of a litter of pigs bred by her father. She names him Wilbur and instantly bonds with him. But when he gets too big, her father convinces her to sell him to her uncle, Mr. Zuckerman, who lives just down the road. Fern visits Wilbur every day, while he settles into his new home making friends with the sheep, the goose and gander, the rat Templeton and the spider Charlotte who lives in the doorway of his pen. It is a very happy life for Wilbur until he realises that Zuckerman plans to eat him. Charlotte promises him that she will find a way for him to survive the winter, and that is when the words ‘SOME PIG’ appear in her web. 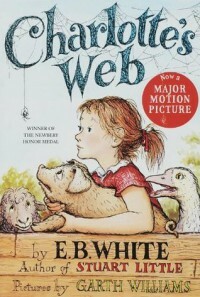 A children’s classic, but enjoyed by readers of any age, Charlotte’s Web is a sweet tale, showing both the idyll of country life and also its harsh realities that country kids learn to accept. But one little girl’s love for her pig and the friendship of a spider gave Wilbur more chances than he would usually get. I challenge you not to feel something while reading this novel.